One of the many (MANY!) reasons I’m a fan of chocolate is that it has both a sweet and savoury side, particularly when it comes to cacao nibs. These little roasted bits of cocoa beans are a lovely addition to any pantry, but I often get asked how on earth to use them. Well, they’re lovely in porridge, muesli and cookies, but also work really in a pesto, salads and – one of my fave easy mid-week meals – with a generous tray of roasted veg. As we hit the “hungry gap” in the UK, when there’s a natural drop off in seasonal fruit and veg that’s available, I’m always looking for ways to spice up what’s in my weekly veg box. 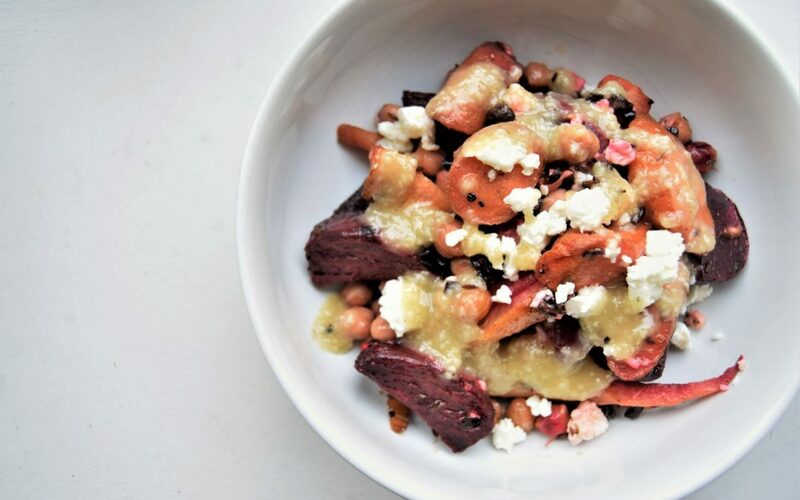 Mixing nutty bitter nibs with sweet roasted root veg, this recipe works as a substantial main or, in smaller portions, as a side dish. It’s also lovely the next day served as a warm salad on a pile of wintery spinach and watercress. 1. Pre-heat your oven to 180°C/160°C fan and prepare all the veg. 2. 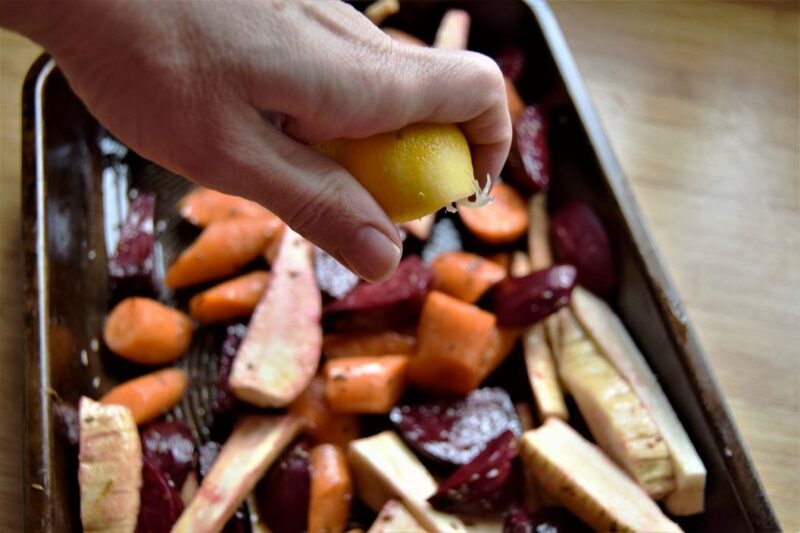 Pop all the chopped veg into a generous roasting tray with the cumin seeds, salt, pepper and a generous glug of olive oil. Mix with your hands so that all the veg are nicely coated. Grate the lemon zest over the veg and squeeze in half the lemon juice, mixing everything again. 3. Put the roasting tray in the oven on the top shelf. 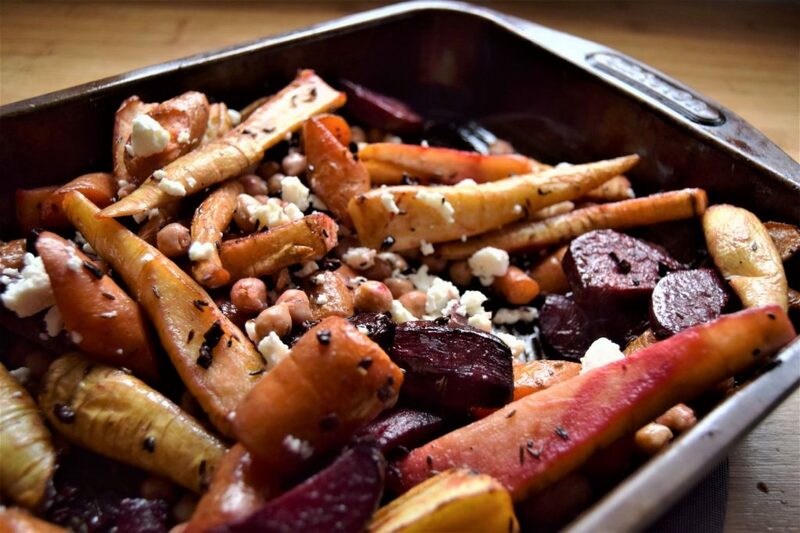 Share a few times while it’s cooking to make sure the veg are evenly roasted. Roast for 35-40 minutes until the vegetables are soft in the middle and crispy on the outside. 4. Add the chickpeas and nibs to the roasting tray, mixing it through, and then move the roasting tray to the bottom shelf of the oven and cook for another 10 minutes. 5. While the veg are cooking, make the tahini sauce. Place all the ingredients in a bowl and whisk until they are well combined. 6. 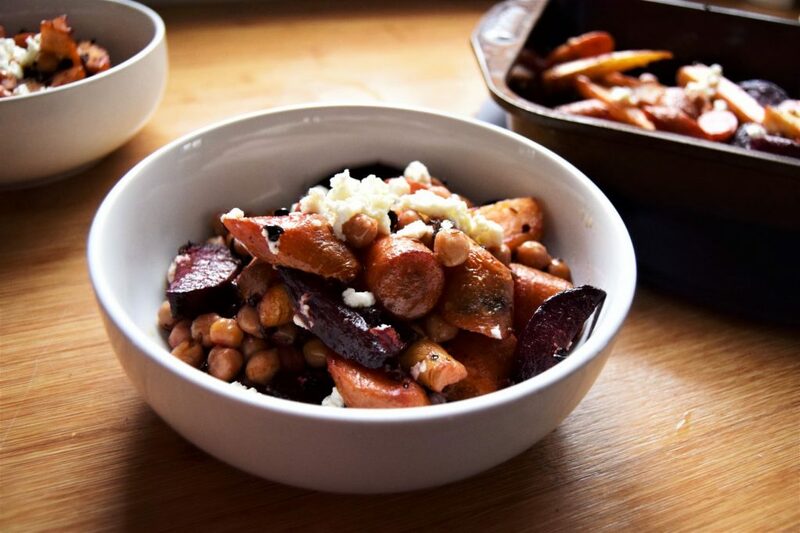 Take the roasted veg out of the oven and divide between bowls. Sprinkle over the feta and spoon over the tahini sauce, and serve warm.